The Log4.USB is a circuit measurement tool that displays accurate readings of voltage, current, and power while also simultaneously logging all measurement data to a MicroSD card and/or PC. The Log4 is compatible with USB 1.0, USB 2.0 and USB 3.0 connection, allowing faster streaming of data. USB3.0 is the current version of the ubiquitous Universal Serial Bus Standard. It allows for SuperSpeed interface providing transfer rates of around 3200Mbps or 3.2Gbps. It also allows for full duplex data transfer, this means the USB3.0 can read and write data simultaneously at full speed. In addition, single device can draw up to 900mA of current, it can also power more than 4 devices from a single hub. Lastly USB3.0 has better power management, polling is replaced by asynchronous notifications. The host no longer need to continuously poll all connected peripheral devices to check if the device has data to transfer. In SuperSpeed USB, the host waits until a higher-level application tells it that there is a peripheral that has data to transfer. Then the host contacts that specific device to check if data is ready for transfer. When both ends of the link are ready, the data is transferred. The four connections on top of Fig. 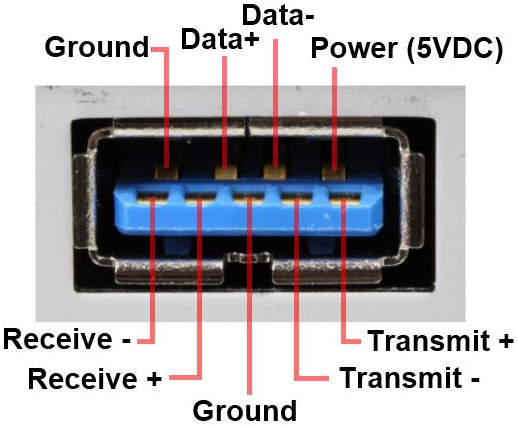 3 (Ground, Data+, Data-, Power) are the pins needed for USB2.0 communication. The two differential pairs (Receive ± and Transmit ±) and one ground are the USB3.0 pins. Do not use the Product around explosive gas, vapor or in wet, damp or dusty environments.